Interesting, interesting. 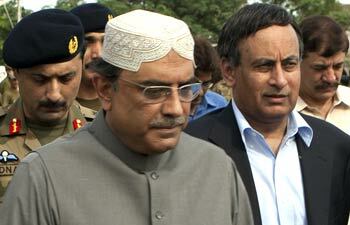 I’d like to think it’s the end of Zardari. The only thing that makes me hesitate down this path was Rahman Malik’s upbeat appearance on TV last night. Either he’s a superb actor, which might well be the case, or then he know’s more fishy business is being planned and we’re stuck with Zardari for a further indefinite period of time. If Gilani becomes number one, I think it will probably be easier to get rid of him than to see the back of his boss. Where Gen Kayani figures in all this is beyond one. Ditto the SJ. This is Pakistan after all, the land of corruption and illusion. Nobody talks about Noon-Goon-e-ala’s heart transplant, surgery or whatever it never was 😉 But inside every one knows it was a fake story the coward brothers used to flee from Pakistan during the RD case. First big FAT boss did go to UK and then Habib Jalib Junior followed to see after big brother. This family business is so vast and dirty. So many people are involved the network and they just have to protect each other just like in any mafia gang. Together they stand and together they fall. Either they have created a family relationship through marriage or they have created a dirty business of loot and plunder together. Let’s see what happens. I hope their time is over since they are still using the same old dirty tricks to run their dirty politics. They are destined for extinction…the Ninosaurs! BTW: Any comment on my concerns on the last bbm that I pointed out? ISLAMABAD, Dec 9: President Asif Ali Zardari ended his silence on Friday to squash rumours about his ill health, incapacity and resignation. Not only did he call the prime minister and speak to him while the latter was in a meeting with coalition partners, he also called journalists to give the news of his well-being and prove that he was not incapacitated. A senior journalist that he spoke to told Dawn that contrary to news reports of his incoherence and impaired speech, the president sounded “his usual self and was in a good mood”. “He laughed when asked about the speculation surrounding his illness,” said the journalist, adding that it was clear that the president was enjoying the media storm in a tea cup that his sudden departure had created. The president also said that he left for Dubai as he did not trust hospitals in Pakistan and that he would be back “soon”…. And that “senior journalist” could be Hamid Mir. He spoke about this in a program with Asma “Hajjan” Shirazi. Zardari has always been exposed, but this “senior journalist” and Asma are dubious too. I have no doubt in my mind that both are paid by Nora League. I suppose you remember how HM exposed Sheeda Tulli and refrained from mentioning the Nora goon during the elections – and that too a day before the elections. Asma is consistently speaking the language of Nora League, but I regard H being more dangerous since he pretends to be neutral. Btw. : Do you have any idea about Saleem Bukhari. I saw him make the same stunt as HM i.e. look like a neutral analyst and make the move (for payment of course) at a crucial time.